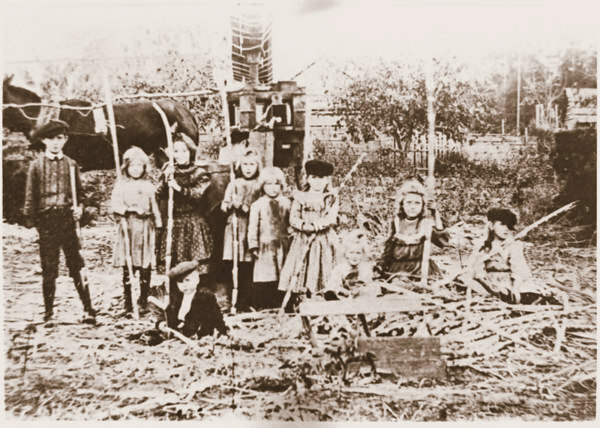 To children of Wiregrass Georgia, sugar cane was the homegrown candy of choice. The harvest of the cane crop, and cane grinding time was anticipated by children of all ages. Now we have reached the point where the [Little] river widens out, and winds along through interminable swamps. Here in the autumn the mellow haws hang red on the trees, and in the sweet Indian summer great festoons of wild grapes and “bullaces” hanging in mellow lusciousness from the vines which have twined their tendrils around the topmost boughs of the tall trees. Fields of yellow corn cover the fertile hillside, the withered stalks rustling and creaking in the whispering breeze. These farmers have inherited a goodly legacy in these broad acres. The cotton fields are white as snow, and the merry jests and hearty laugh attest the contentment of the laborers. In striking contrast with the brilliant colors of the autumnal foliage is the deep blue green of the sugar cane. Through long years of cultivation in alien soil it has preserved its identity as a child of the tropics, and holds its green until the great leveler, Jack Frost, chills its sugary sap. Other plants have learned to adapt themselves to the new order of things, and shorten the season of their growth accordingly, but the sugar cane never ripens. If I have dwelled long on the peculiarities of this plant it is because I have experienced so many perils and pleasures in connection with it. Is there a south Georgia boy, to-day, who never slipped in at the back of the cane patch, starting nervously as he chanced to snap a blade, picking his way carefully until a selection was made, then cutting down the cane by easy stages, so that it would not crack loudly when it fell; carefully stripping of the blades one, by one, then stealing noiselessly out, ensconcing himself in a fence jamb and then – oh! the delicious taste of the juice! “Trebly sweet when obtained through so much peril. Hark! Ahem!” The boy springs to his feet and trembling in every limb beholds the “old man” leaning his elbow on the fence and watching him intently. “Ahem!” “Is it gittin’ sweet yet sonny?” But the boy is too dumbfounded to answer. ” “Well, I guess I’d better give ye a row, and you musn’t cut any out’n the rest of the patch.” Oh! Joy! In less than ten minutes every child on the place is informed that “pa has give us a row of cane to chaw.” And the old man stalks about in the potato patch in search of a late watermelon, an odd smile on his lips. He passed the same experience some twenty or thirty years ago. If you want to learn more about the traditions, practice and science of Georgia cane syrup making, be sure to see Bill Outlaw’s essays at Southern Matters http://www.southernmatters.com/ where he shares family history and research on sugar cane and syrup production, along with other connections to the past.